Good. 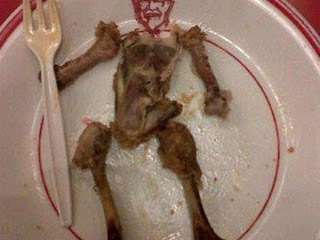 Tell your parents to buy you KFC. SHow your parents your responsible, start doing things around the house without being asked.. Also make sure you tell your mom she is beautiful and that you are glad she is your mother. Tell your dad that he has taught you well and you are proud he is your dad. You might laugh at this but, it will work, but you will have to put some work into it. Oh and dont shower them with complements just make it one or two. Enough for them to feel like you are appreciate of them not a brown noser. You need to show you are growing up and maturing. Obay rules and take it upon yourself to get things done around the house and school work do that first house work second and play time last. Your parents will see you are mature enough to do more things. BTW its better to have parents that care then ones that don't. Nay. That's no monster. It's a Koopin. Well , I would present your case to your parents, if they still resist to reason....well, sometimes breaking the rules every once in awhile is good for intellectual and personal growth. You are after all, a kid. If you get in trouble, then you get in trouble, that's part of life. I was for the most part a good child in my youth but even I broken the rules once in awhile to go out and have fun, and looking back I'm glad I did. You're only a kid once. This only causes a parent child struggle in rebelling, rebelling doesn't work it just causes more stress on you and your parents. I still say show them your responsible enough to go out. I don't know why I was addressing this to you. I meant to address the OP. At any rate I would posit that reasoned and selective rebellion is sometimes necessary. Didn't realize it took this long to get kfc. Oh well, another one bites the dust. Can someone explain the significance of the KFC comment? Is this a DDO inside joke? And as that statement was made, millions of chickens frolicked to kfc to fulfill their sole duty in life. Anyways, back to the topic, I would recommend that you at least try out going along with what your parents say. Follow whatever they say diligently for say, a month, then try something else and compare results. I think you will find that one method will bring you close to your family whereas the other will bring you closer to your friends. For your age, its a completely even decision. And its your own choice. Get a job. That gets you out of the house and shows responsibility. Not to mention having your own money which gives you tons of leverage.